After arriving in New York on late Thursday night, I had a jam-packed Friday! I can’t quite tell you what I was doing but as soon as I can spill the beans, I will! Then, when my best friend arrived on Saturday, we checked into our hotel– The Empire (aka of Gossip Girl fame) we set out to explore the city. New York is such a beautiful city (truly, a concrete jungle where dreams are made) but Central Park is also one of my favorite areas. As we walked around the perimeter of the park we looked for a place to sit down, have brunch and catch-up! 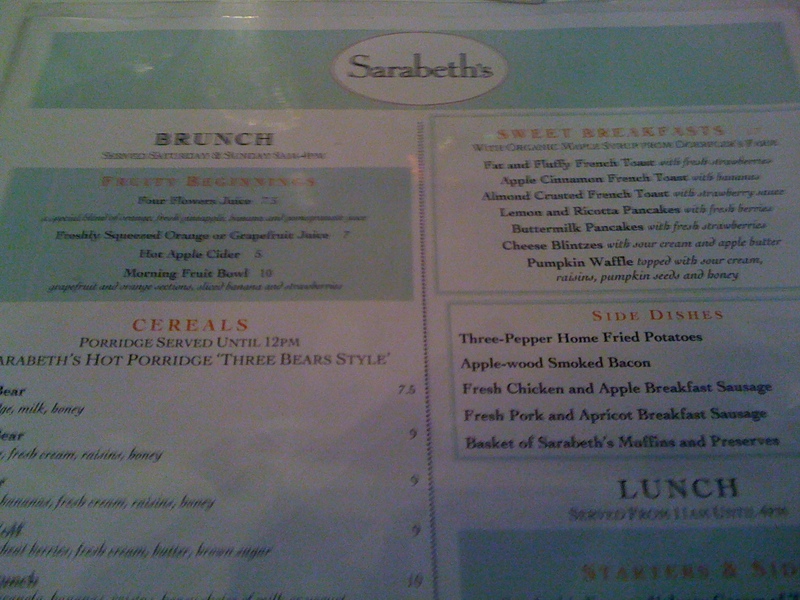 Chelsea had heard good things about Sarabeth’s and it was recommended by the concierge at our hotel, so we decided to give it a try! Outside was a large crowd and a line that wrapped inside but we figured we’d give it a shot and see how long the wait was for a table. (Thankfully, it wasn’t 2 hours like the last Brunch I reviewed!) Miraculously, she said she could take us right away and walked us to a cozy banquette in the back of the restaurant. Sarabeth’s is an upscale restaurant with a homey feel, a place where you really can sit and talk for hours, which was exactly what we were looking for! When it came time to order, I knew that some serious carbs were going to be involved! Since I don’t eat eggs, my brunches usually involve yogurt or carbs for me and that day I was craving something warm and delicious! Everything on the menu looked amazing and I was torn between the lemon ricotta pancakes, the pumpkin waffle and the almond crusted french toast. Ultimately, I went with the french toast, a choice I seem to be making a lot lately! Luckily, the dish didn’t disappoint! 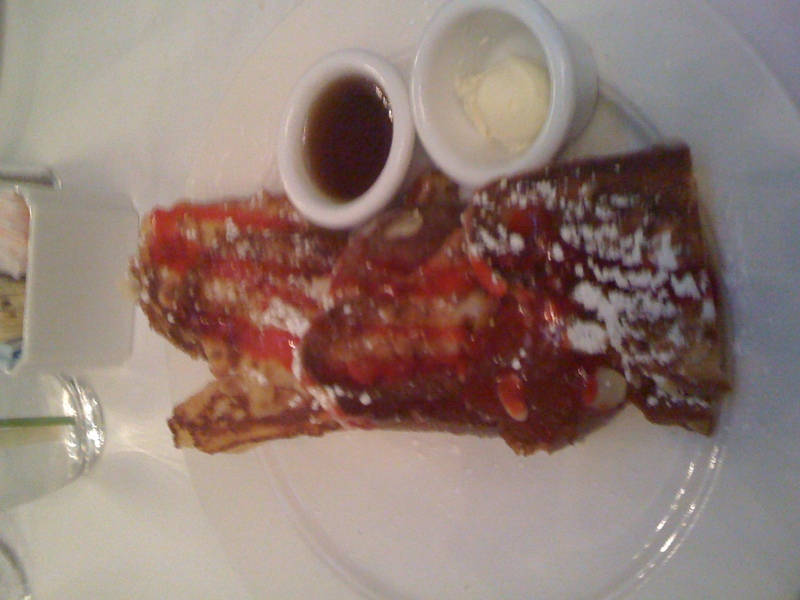 While enjoying the perfectly crispy, chewy french toast drizzled with strawberry sauce and sipping cup after cup of hot, delicious coffee, I got the chance to sit and just chat with my best friend. Chelsea and I have been besties since our first day of preschool where my mom recently told me that we held hands that day and were inseparable. It was also the day that we told each other we would always be best friends. 🙂 I’m so happy to say that our childhood prediction came true and after different schools and different cities (she now lives in DC) we still remain close. So sitting with her and chatting was truly a joy and the delicious food just made it that much better. I also have to say that the services at Sarabeth’s was phenomenal. They were very diligent and made sure my water and coffee were always full and checked on us without being obtrusive. It made for a perfectly lovely experience and I hope to go back next time I’m in New York… after all, I need to try those ricotta pancakes! -Do you prefer a carby or protein packed breakfast? -Are you still close with any of your childhood friends? Tell me a story! I’m definitely an “eggy” breakfast person! But I think it’s because I love cheese more than I love the actual eggs (I always couple them together). 🙂 For some reason, when I eat carb-rich breakfasts they sit in my stomach like a rock most of the morning. Haha. But that’s not to say that I don’t love a stack of pancakes once in a while! Can I say both?! I love protein AND carbs in my breakfast! 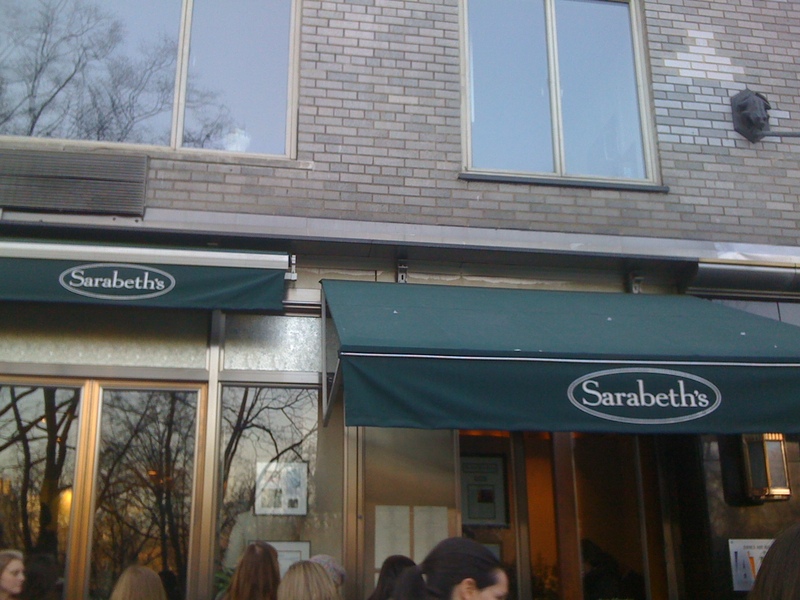 I’m so glad you liked Sarabeth’s…I’ve been dying to go there! Carby. Definitely carby…. i love pancakes so much. Ok…. post reading your comment I popped back over here to get a glimpse of the french toast, which I apparently already read about LOL… GOOD CHOICE! but wait, why can’t you eat eggs? not a fan? FULL REVIEW of the Empire is needed! Tell me you saw them filming. Just tell me. That french toast looks unreal! I’m definitely a carby eater in general, and breakfast is no exception! I am super close to my childhood friends (my friends from elementary school are my best friends to this day). I love the holidays because that’s when everyone is back in town and we get to spend so much time together!